The Vancouver International Airport in mid-February released final passenger numbers for 2018, confirming another year of record-breaking growth, as it embarks on a $9.1 billion, 20-year infrastructure expansion project based around 75 major capital improvement projects. YVR welcomed more than 25.9 million passengers in 2018, a 7.3 per cent increase over 2017, reaching its 25 million passenger milestone two years ahead of forecast. YVR is on track to serve more than 29 million passengers in 2020, with projections indicating the airport will serve 32 million by 2022. This is a similar story of passenger growth over the past decade across most major Canadian airports and often overlooked is the corresponding growth of cargo running out of these expanding airport infrastructures. YVR, for example, moved 338,000 tonnes of cargo, an 8.1 per cent increase from 2017. The Boeing Company in late 2018 issued its biennial World Air Cargo Forecast (WACF) to summerize the world’s major air trade markets, identify major trends, and present forecasts for the future performance and development of markets, as well as for the world freighter airplane fleet. The next update to the WACF will appear in Q4 2020. Boeing projects air cargo operators will need more than 2,600 freighters over the next two decades to keep up with increasing global freight traffic, which is expected to double with 4.2 per cent growth annually. The 980 new medium and large freighters and 1,670 converted freighters will go toward replacing older airplanes and growing the global fleet to meet demand, according to the World Air Cargo Forecast. 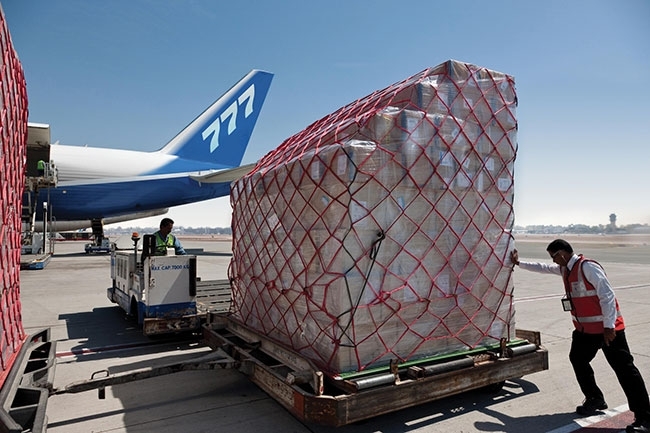 Some of the factors driving the growth in air cargo, explains Boeing, include a growing express market in China and the global rise of e-commerce, which is forecast to increase 20 per cent annually to nearly US$5 trillion in 2021. To meet growing market needs, Boeing also forecasts the world freighter fleet will expand by more than 70 per cent, from the current total of 1,870 to 3,260 airplanes. Boeing projects new production freighter deliveries valued at US$280 billion. Demand for regional express services in fast-developing economies will boost the standard-body share of the freighter fleet from 37 per cent today to 39 per cent. The company projects 1,170 standard body and 500 medium wide-body passenger airplanes will be converted into freighters over the next two decades. Dedicated freighters, which Boeing explains to provide unique capability that passenger belly-cargo cannot match, will continue to carry more than 50 per cent of the world’s air cargo demand. The company expects the majority will be in the large wide-body freighter category, such as the 747-8 Freighter and 777 Freighters. Air cargo traffic grew 10.1 per cent in 2017, more than double the long-term average growth rate. In the next 20 years, Boeing projects air cargo traffic will more than double and the world freighter fleet will grow by more than 75 per cent. Global retail e-commerce sales were US$2.3 trillion in 2017, more than double the US$1.1 trillion spent in 2012.